Whole Home Ultraviolet Water Disinfection is a proven, non-chemical treatment system. UV uses ultraviolet light to disinfect your water, without the use of harsh chemicals, like chlorine. They are lightweight, easy to use and simple to maintain. UV will provide you with clean, disinfected drinking water for years to come. UV water disinfection has easy to change lamp and filters, lamp and ballast matched for quality assurance and simple installation. These UV systems are guaranteed to be free from defects in materials and workmanship for a period of twenty-five years†. †Lamps sleeves and filters are under warranty for one year. UV light disinfects by interfering with a microorganisms DNA, inactivating bacteria, spores and viruses. UV light penetrates an organism’s cell walls and disrupts the cell’s genetic material, making reproduction impossible. Therefore, microbes can’t reproduce to make you sick. The UV model is designed to provide disinfected water at a flow rate up to 10 gallons per minute. This system is ideal for whole house water treatment. In addition to disinfection, it provides filtration for the removal of sediment and chemical contaminants. The UV model is the perfect solution to provide, clear, chemical-free, comfortable water. The UV model is designed to provide disinfected water at a flow rate up to 15 gallons per minute. This system is ideal for whole house water treatment. In addition to disinfection, it provides filtration for the removal of sediment and chemical contaminants. 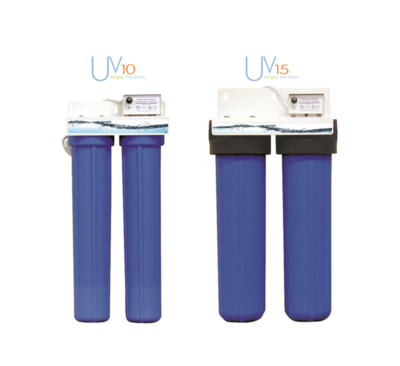 The UV model is the perfect solution to provide, clear, chemical-free, comfortable water.